Taliban kill 14 Afghan soldiers, take another 21 captive in the western Herat province, official says. 2 suicide attacker arrested by Afghanistan's NDS special forces moment ago in Kabul, Darlman Street. IEC chief says the decision to invalidate Kabul votes is a "dishonor" to people's will who cast their vote in the parliamentary elections despite challenges. McKenzie earlier estimated the size of the Taliban at 20,000 - later corrects himself and says 60,000 Taliban fighters out there. Interior Ministry spokesman Najib Danish confirms that Tamim Shansab along with 18 armed men were arrested and that security situation is under control in Kabul's Shahr-e-Naw area. Sgt. Jason Mitchell McClary, 24, from Export, Pennsylvania, died Dec. 2, 2018, in Landstuhl, Germany, as a result of injuries sustained from an improvised explosive device on Nov. 27, 2018, in Andar District, Ghazni Province, Afghanistan, DoD says. Taliban claimed CP and reinforcements attacked in Hastogana area of Zurmat Paktia last night, 3 APCs destroyed, 7 soldiers along with 2 commanders (Sarchapa and Ghaffar) killed, multiple wounded. 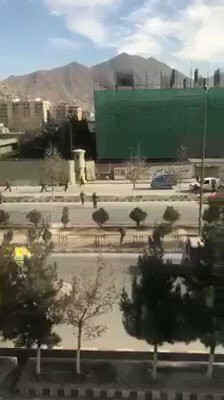 Video from Armed clash in Kabul. Still armed clash going on between Guard of former MOD minister Rahim Wardak's son and security forces in Shar e New Area. People were terrified،closing stores and leavening the Area. Afghan Taliban say it has shot down a U.S. Chinook helicopter during its landing in Nalyano area of Tagab district of Kapisa last night. Taliban are claiming all personnel aboard have been killed. 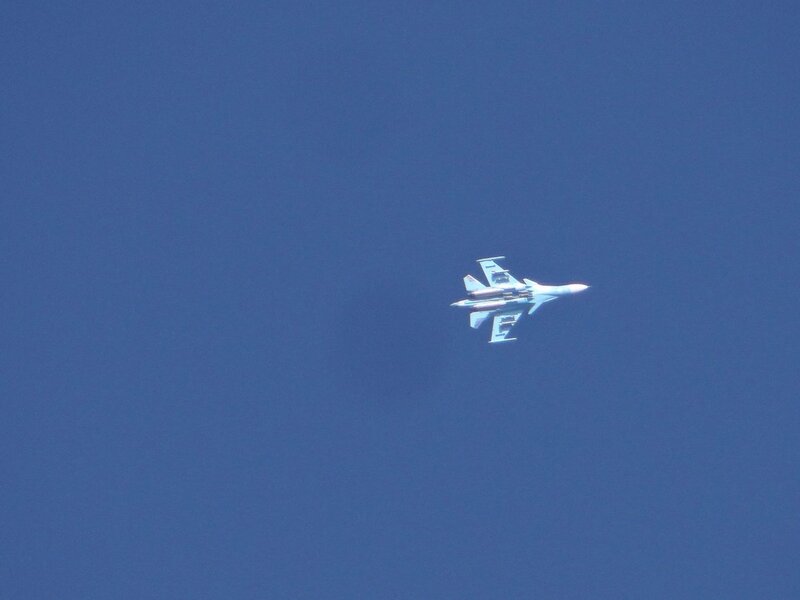 No confirmation so far from NATO or Kabul admin. 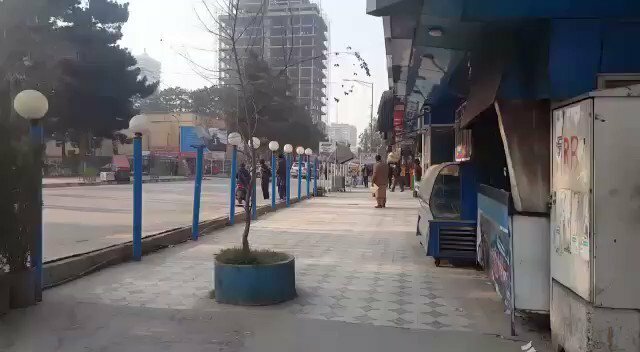 An attack is currently taking place near the locality of the Afghan Attorney General office in Kabul city. 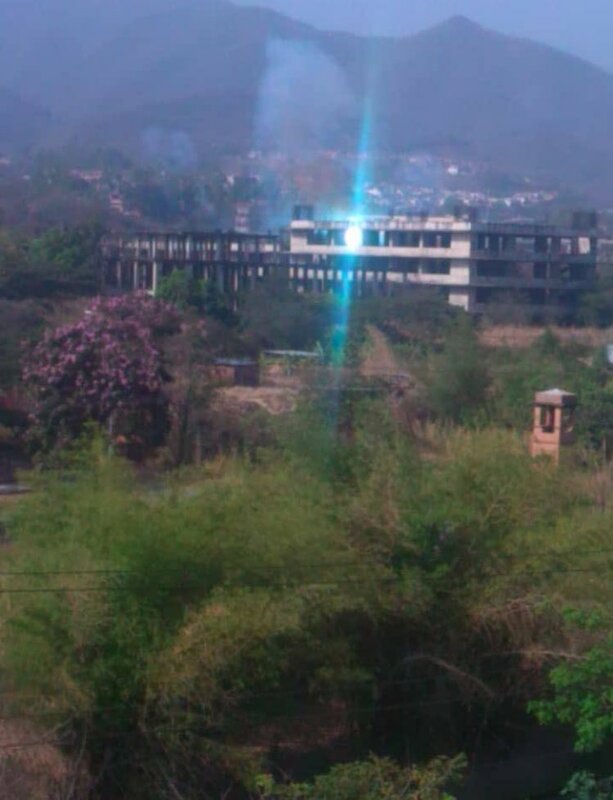 Heavy gunfire reported. 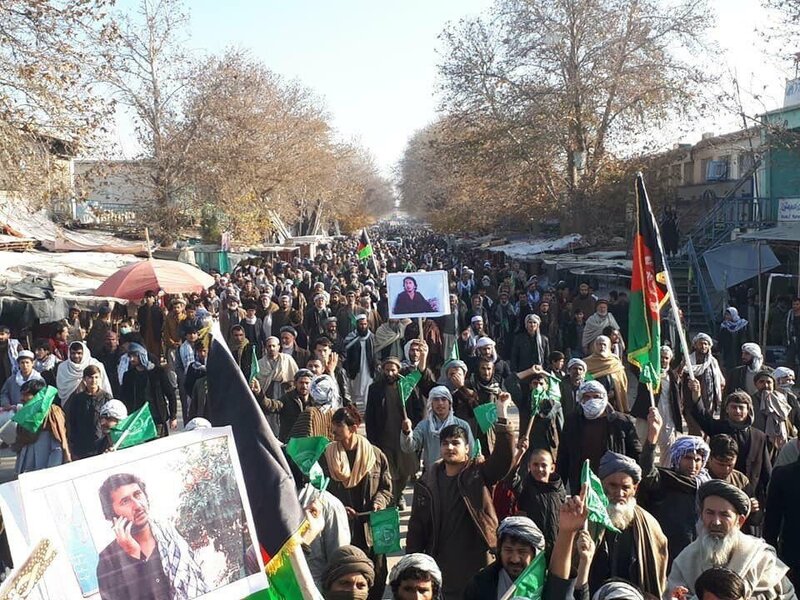 After protests broke out in support of a militia commander in Khanabad District, Taliban envoy trying to reach a deal with government. 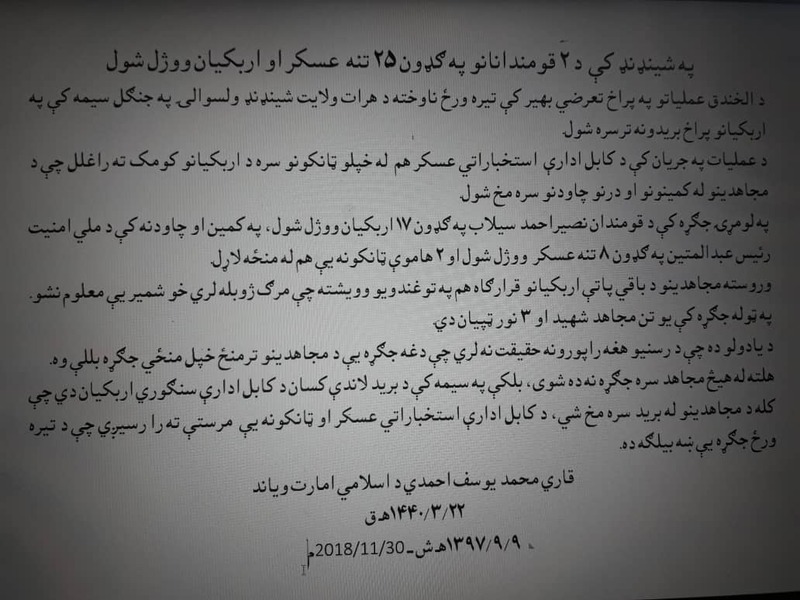 Offering to release ANDSF commandos in exchange for the ALP commander Navid. 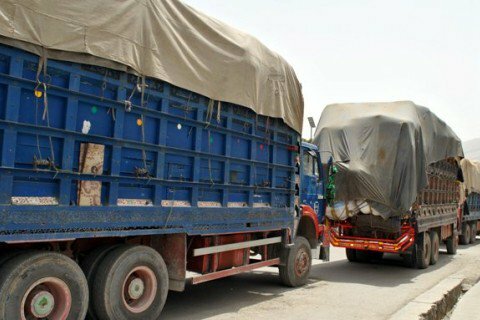 Samangan police confirmed that Taliban has released 45 truck drivers on Monday who were abducted in Dara-e-Soof district in the province on Sunday. The police said that "Taliban has asked drivers to pay money for each delivery of coal from the district". ISKP has released a photo report showing the execution of a Taliban militant in Nangarhar. Resolute Support releases a footage of a drone strike, targeting a Taliban center in Sangin district in Helmand. The Resolute Support says at least 29 Taliban militants were killed in the airstrike. 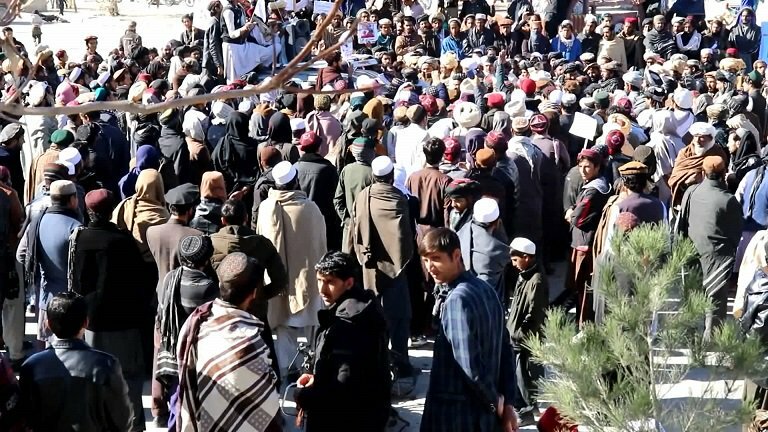 Hundreds of people in Paktika staged protest against the killing of civilians by American and Afghan forces in Gomal district, at least 11 civilians were killed and wounded and many homes destroyed. Islamic State (ISKP) claimed wounding three pro-govt Afghan militiamen in an IED blast in Nangarhar. Briton killed in terrorist attack on G4S compound in Kabul has been named as Luke Griffin, 33, from Merseyside.